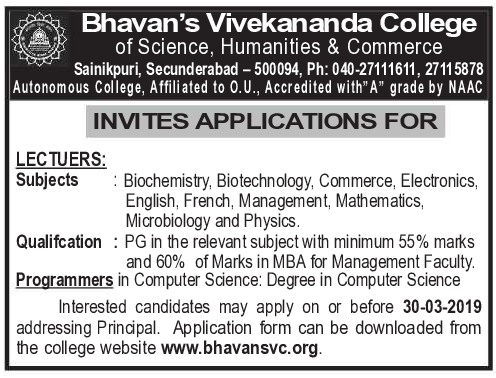 Bhavan's Vivekananda College of Science Humanities and Commerce, Secunderabad has advertised in the EENADU newspaper for recruitment of Lecturers / Programmers jobs vacancies. Interested and eligible job aspirants are requested to apply on or before 30th March 2019. Check out further more details below. About College: Bhavan's Vivekananda College of Science, Humanities and Commerce was established in 1993 under the aegis of the Bharatiya Vidya Bhavan, Mumbai. The sprawling 50 acres verdant campus has a peaceful atmosphere essential for academic pursuits. The campus is located at an accessible distance of 8 kms from Secunderabad station and 2.5kms from Ramakrishnapuram railway station. How to Apply: Interested and eligible candidates are requested to send application in prescribed format along with copies of certificates and PP size photos to the postal address given below.